The T-H3M-DV-N is a new breed of tankless for smaller spaces. This model also uses existing 1/2" gas supply lines and inexpensive PVC venting to lower installation costs. 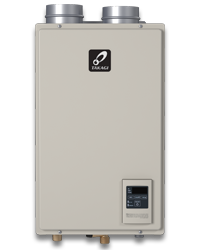 The T-H3M is a high efficient, condensing tankless water heater perfect for residential applications. The T-H3M can produce enough hot water for two bathrooms in warmer climates or 1.5 baths in colder climates. The 9008953005 Pipe Cover protects the plumbing pipes to the water heater from unexpected adjustments. This pipe cover is fixed to the bottom of the water heater, which hides the plumbing and improves the visual aspects of the whole installation for the water heater. The 9009069005 Temperature Remote Controller (TM-RE42) has two functions. It allows the output temperature from the water heater to be adjusted within the range of 100 °F to 160 °F (check Owner’s Manual for setting options), and it also works as a diagnostic tool that will give a concise error code whenever there is a problem with the unit. The 9008172005 Temperature Remote Controller (TM-RE40) has two functions. It allows the output temperature from the water heater to be adjusted within the range of 100 °F to 185 °F, and it also works as a diagnostic tool that will give a concise error code whenever there is a problem with the unit. The 9007607005 Neutralizer assembly neutralizes the condensate (acidic water) that forms in the secondary heat exchanger of the water heater. It connects to the condensate drain port of the water heater by using connectors included with the neutralizer kit.